The rare elongated galaxy is made of a cluster head of young stars with much older stars trailing behind it and is thought to be around 82 million light years away. A rare spot by the Hubble telescope has got astronomers excited. The findings were that of a tadpole galaxy – so called because of its elongated shape and a cluster head of stars. Not many have been spotted near the Milky Way but this one is thought to be around 82 million light-years away. 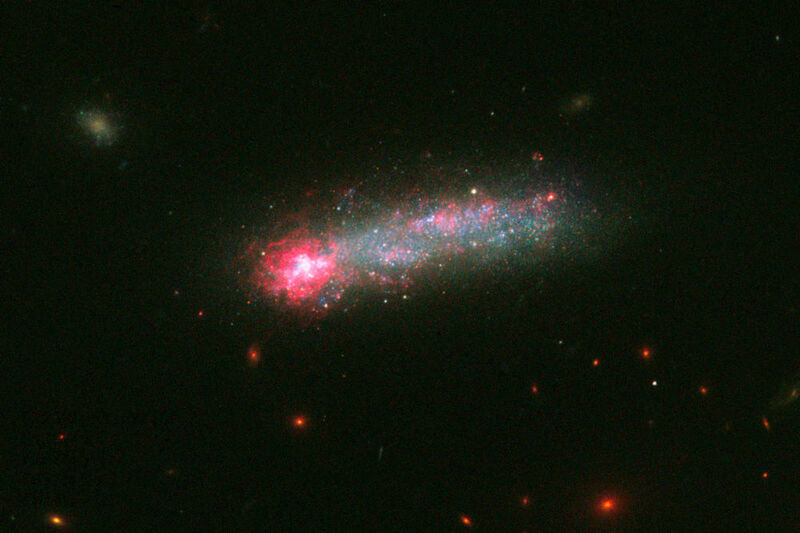 The uniquely-shaped galaxy, named LEDA 36252, is rare because of the lack of gas in the universe, yet still has stars – also known as KISO 5639 – forming within it with the higher concentration of stars near its head thought to be less than a million years old. The trailing stars in its tail are thought to be hundreds of millions – even billions – of years old. According to a report by UPI, the young stars in its head is equal to around 10,000 suns and picks up gases as it moves through the universe allowing the galaxy to form. Dr. Bruce Elmegreen, an astronomer at IBM’s Thomas J. Watson Research Center commented on the findings in a recent press release. The discovery will go towards helping scientists understand the evolution of galaxies especially starburst activity, the accumulation of cosmic gases and the formation of globular star clusters. “I think Kiso 5639 is a beautiful, up-close example of what must have been common long ago. The current thinking is that galaxies in the early universe grow from accreting gas from the surrounding neighborhood. It’s a stage that galaxies, including our Milky Way, must go through as they are growing up,” said lead researcher Debra Elmegreen. More details of the images and analysis were published in The Astrophysical Journal.